Northwest Hills specializes in preparing people for marriage and for meaningful celebrations of God’s love in your lives. You need not be a member of Northwest Hills to be married here or by one of our pastors in off site locations. Our wedding services are Christian based. Those previously married are also invited to make a new beginning. If you are interested in being married at Northwest Hills, please contact us at 402-572-8392 as to the availability of our church and/or pastors, associated costs and to visit our sanctuary. Couples are required to participate in premarital counseling sessions beginning six months prior to the wedding date. In the first session the couple takes the Taylor-Johnson Temperament Analysis which is a tool to help the couple understand how well they communicate with one another. In the second session we discuss the results of the T-JTA. There are two more sessions in which the pastor and the couple discuss the gift of God’s love in their relationship, communication skills, and conflict management. These sessions are for all couples including those previously married. Our wedding coordinator will also assist you at the church with your decorations, candles, the rehearsal, pictures and sound. 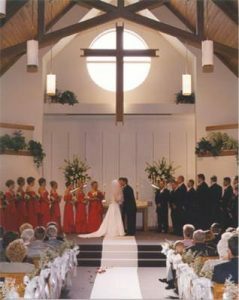 The cost to non-members for a wedding at Northwest Hills including the pastor’s fee is approximately $780. For Small Weddings (15 or fewer people total) — Service with rehearsal immediately before and no other set up is $300 including Pastor’s fees; $325 if sound system is required. For off-site weddings, the fee is $300. Copyright © 2017 Northwest Hills Church.